Ready to learn a little about CBD hemp oil? We took a deep dive into the most common questions people tend to ask about CBD. Check out what we discovered. First, a little bit about the history of hemp. Hemp has been cultivated by humans for over 10,000 years and is grown in many parts of the world, including North America. Hemp plants produce nutritious seeds that are high in protein and have many uses, such as being pressed into a healthy culinary oil. These seeds are also used to make hemp milk, an alternative to dairy milk. Hemp stalks are used for paper and textiles and can supply the base for green building materials and alternative fuel. Hemp is an earth-friendly plant that gives nutrients back to the soil it's planted in, grows densely so herbicide isn't required, and is the perfect rotation crop. In addition, the crop grows rapidly and is ready for harvest in just a few months, making it highly sustainable and renewable. CBD stands for cannabidiol and is one of over 100 known phytocannabinoids that naturally occur in cannabis plants. It’s also one of the most prolific cannabinoids found in hemp plants. CBD has very low THC – less than 0.3% – which is why CBD doesn’t make people feel high. In fact, CBD can actually counteract the euphoric/high feeling caused by THC. CBD continues to gain popularity as studies reveal its potential benefits for human health. ECS is the endocannabinoid system - the human body is self-regulating, so like a tightrope walker, it’s constantly shifting to stay balanced and healthy, a process called homeostasis. One way our bodies maintain homeostasis is via the endocannabinoid system (ECS). It keeps our bodies functioning optimally by adapting to change. The ECS, sometimes referred to as the “Master Control System,” is made up of receptors on cell membranes that regulate a variety of processes including eating, sleeping, relaxation and cognition. The ECS also assists in the body’s overall recovery and repair. Our bodies naturally produce compounds called endocannabinoids (endo=inside) that bind to those receptors, like a key fitting into a lock. CBD hemp oil is a plant-based cannabinoid – or phytocannabinoid (phyto=plant) – that acts upon cell receptors in a similar way to help activate the ECS. What is a CB1 Receptor? CB1 (cannabinoid-1) is a receptor type in the ECS believed to be located primarily in the brain and peripheral nervous system, activated by all types of cannabinoids. CBD signals the body’s natural mechanisms to activate those receptors to do more of what they do naturally. What is a CB2 Receptor? CB2 (cannabinoid-2) is a receptor type in the ECS believed to be located primarily in the peripheral tissues of the immune system, the gastrointestinal system, the peripheral nervous system and to a lesser degree in the central nervous system. CBD signals the body’s natural mechanisms to activate those receptors to do more of what they do naturally. Cannabinoids are compounds that activate cannabinoid receptors (CB1 & CB2)), including endocannabinoids, phytocannabinoids, and synthetic cannabinoids. “Phyto” means plant – phytocannabinoids are the cannabinoids naturally occurring in plants like hemp. Many plants make cannabinoids, but hemp plants contain particularly large amounts of many cannabinoids, with CBD (cannabidiol) being the most prolific. “Endo” means within – endocannabinoids are cannabinoids produced naturally by cells in the human body. Terpenes are compounds found in the essential oils produced by many plants (what makes a lemon smell like a lemon), including cannabis. Terpenes bond with cannabinoids to turbo charge them creating synergistic effects, otherwise known as the Entourage Effect. Different combinations of terpenes and cannabinoids have different effects. Full spectrum is all the good things you get from a plant. The good things come from a wide range of cannabinoids, terpenes, antioxidants, nutrients and other plant compounds present in the hemp plant. It can provide a greater effect than CBD alone as all the cannabinoids work together, as nature intended, in what is known as the entourage effect. A recent study from Israel has documented the superior therapeutic properties of whole-plant (full spectrum) cannabis extract over single-molecule (isolate) cannabidiol (CBD)*. The entourage effect is when the various compounds of a full spectrum CBD hemp oil are combined, their benefit is greater than what you’d receive from each individual component. This is also what we call synergy: the whole is greater than the sum of its parts. There are over 100 ‘identified’ compounds in the cannabis plant. While most of these compounds have their own therapeutic benefits, they combine synergistically* to provide far better results. While many people consider cannabis and marijuana to be interchangeable terms, Cannabis is actually a plant family with three different sub-specials, of which marijuana is one: Cannabis sativa, Cannabis indica and Cannabis ruderalis. Hemp - sometimes referred to as industrial hemp - comes from the non-psychoactive varieties of Cannabis sativa L, which have 0.3% or less of tetrahydrocannabinol (THC). Hemp is similar to marijuana, in that they come from the same plant family (cannabis), but are genetically distinct and are different in their use, chemical makeup, and cultivation methods. Sort of like lemons and oranges are both citrus fruits. Would you like a quick hemp history lesson? Hemp has been cultivated by humans for over 10,000 years and is grown in many parts of the world, including North America today. Hemp plants produce nutritious seeds that are high in protein and have many uses, such as being pressed into a healthy culinary oil. These seeds are also used to make hemp milk, an alternative to dairy milk. Hemp stalks are used for paper and textiles and can supply the base for green building materials and alternative fuel. Hemp is an earth-friendly plant that gives nutrients back to the soil it is planted in, grows densely so herbicide is not needed, and is the perfect rotation crop. In addition, the crop grows rapidly and is ready for harvest in just a few months, making it highly sustainable and renewable. What does CBD do in the body? When we consume CBD, the cannabinoids and terpenes act upon receptors within our bodies’ endocannabinoid system (ECS). This means CBD helps to support our ECS as it controls our responses to pleasure, memory, appetite, sleep, coordination and both sensory and time perception. CBD also attaches to receptors in the brain that are related to Serotonin production, to receptors that are anti-psychoactive, and to various other receptors that support our health. CBD has been the subject of many peer reviewed medical studies* in regard to various aspects of human health. However, due to DSHEA (Dietary Supplement Health and Education Act of 1994) guidelines, we cannot specifically state conditions CBD may address. We encourage you to do your own research, consult with healthcare providers familiar with CBD, and use PubMed.gov as a resource as newly published research is coming out in real time. Phytotherapy Research27 No. 5(2013): 633-636, Cannibidiol in Inflammatory Bowel Disease. Authors: G. Esposito, D.D. Filippis, C. Cirillo, T. Iuvone, E. Cappocia, C. Scuderi, A. Steardo, R. Cuomo, L Steardo. Journal of the American College of Cardiology56 No. 25(Dec. 14, 2010): 2115, Cannibidiol Attenuates Cardiac Dysfunction, Oxidative Stress, Fibrosis, Inflammatory and Cell DeathSignaling Pathways in Diabetic Cardiomyopathy. Authors: M. Rajesh, et al. Neuropharmacology103 (2016): 16, Cannabidiol Induces Rapid-Acting Antidepressant-like Effects and Enhances Cortical 5-HT/Glutamate Neurotransmission: Role of 5-HTIA Receptors. Authors: R. Linge, L. Jimenez-Sanchez, L. Campa, F. Pilar-Cuellar, R. Vidal, A. Pazos, A. Adell Diaz. CNS Neurol Disorders—Drug Targets13 No. 6 (2014): 953-960, Antidepressant-like and Anxiolytic-like Effects of Cannabidiol: a Chemical Compound of Cannabis sativa. Authors: A.R. de Mello Schier, N.P. de Oliveria Riberio, D.S. Coutinho, S. Machado, et al. British Journal of Clinical Pharmacology 75 No. 2(May 25, 2012): 323-333,Cannabidiol for Neurogenerative Disorders: Important New Clinical Applications for this Phytocannabinoid? Authors: J. Fernandez-Ruiz, O. Sagredo, M.R. Pazos, C. Garcia, R. Pertwee, R. Mechoulam, J. Martinez-Orgado. Just as lemons and oranges are both citrus fruits, hemp and marijuana come from the same plant family, but are different in their genetic makeup, use, and cultivation. Hemp contains a negligible amount of THC, but is higher in CBD. It’s used in foods, dietary supplements, skin products, clothing and paper. Marijuana is generally grown to have higher levels of THC, the psychoactive compound that gets you high. Marijuana generally has lower levels of CBD. As far as your body’s concerned, CBD is CBD, regardless of whether it comes from marijuana or hemp as the molecules look the same, just as Vitamin C molecules would look the same extracted from oranges or rosehips. 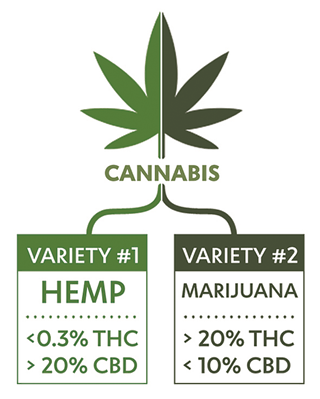 It’s important to keep in mind that hemp and marijuana are different subspecies of the same plant, Cannabis sativa L. A defining characteristic that makes hemp different from marijuana is its low volume of THC (<0.3%). You won’t get high from taking CBD hemp oil. It is made from industrial hemp, so it doesn’t contain nearly enough THC for you to experience the “high” associated with marijuana. While there are trace amounts of THC in CBD hemp oil, your body couldn’t physically consume the amount of it needed to ever get high. We’re talking truckloads. And we’re pretty sure you don’t want to drink that much of ANY oil. The uptake of CBD depends on several factors such as your current health, your digestion, and the amount (mg) of CBD hemp oil you take. The best source of info on what to expect in relation to time and effect may come from talking to your healthcare professional, or simply by seeing how your body responds. What will I notice when I take CBD hemp oil? That depends on the amount used, frequency, and length of use. Your body’s metabolism, weight, and health status all play a role in determining your response to CBD oil. Some people report a quick response, while others report a slower response. We definitely recommend chatting with your healthcare provider if you have any questions about how CBD hemp oil may be working for you. When is the optimum time to take CBD hemp oil? That probably depends on your specific situation. As with any supplement, we recommend health care provider counseling. Your provider (assuming he or she is familiar with CBD) should be able to provide you with guidance on whether there’s a specific time of day or situation that’s best for you to supplement with CBD hemp oil. We are also beginning to learn CBD interacts with some medications, similar to how grapefruit interacts with some medications. Read this blogpost to learn more. Remember, everyone is different and it’s always a good idea to discuss your concern for any possible side effects or interactions with your healthcare professional. What's the difference between culinary hemp seed oil and CBD hemp oil? Culinary hemp seed oil is pressed only from hemp seeds, and it’s often used as a cooking oil or in recipes as a healthy fat that provides Omega-6 and some Omega-3. Culinary hemp seed oil contains a very low amount of CBD and little to no THC. CBD hemp oil can be extracted from hemp stalks, leaves, seeds and flowers. Unlike hemp seed oil, CBD hemp oil is used specifically to provide the body with additional cannabinoids, primarily CBD. 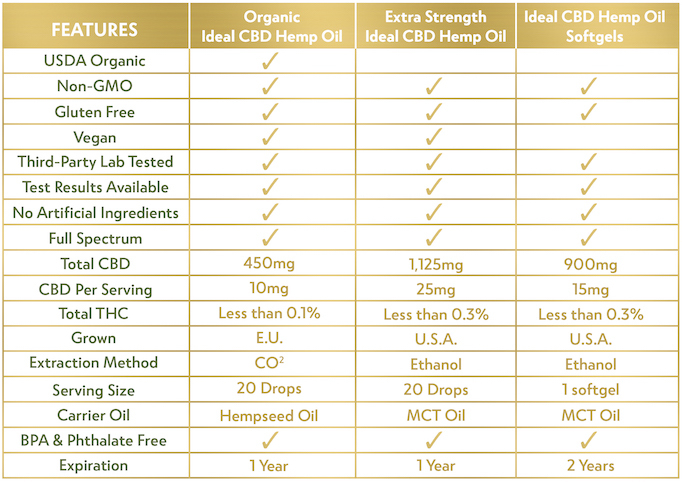 The amount of CBD in CBD hemp oil varies, with some products offering a very limited amount of CBD per serving, and others being quite concentrated. CBD from hemp contains <0.3% THC, so it won’t get you high. Though there are still some legal hurdles, the passing of the 2018 Farm Bill in December cleared up the confusion on whether or not CBD and hemp are legal. * What does this mean exactly? Hemp is now permanently removed from the Controlled Substances Act (CSA). It is forever deemed an agricultural commodity and is no longer mistaken for marijuana. Hemp farmers may now finally access needed crop insurance (Title XI) and fully participate in the USDA programs for certification and competitive grants. This is a huge win for farmers. CBD derived from hemp is no longer considered illegal by the DEA as long as it contains less than 0.3% THC. However, CBD derived from marijuana is still not legal on the federal level, nor are CBD products containing more than 0.3% THC. It’s unlikely, but it could. Hemp does contain a very LOW amount of THC (less than the legal limit of 0.3%), but it’s highly unlikely the trace amount of THC in our products would show up on a typical drug test. However, much like when you eat foods that contain poppy seeds, there is a small possibility it could. This probably depends on the amount of CBD you’re taking and how long you’ve been taking it. Of course, it also depends on exactly what someone is being tested for. This is also true with culinary hemp oil and hemp protein products that could also contain trace amounts of THC. Hemp extract is the oil extracted from hemp plants. This oil contains many terpenes and phytocannabinoids, including CBD. Can CBD/cannabis cause allergic reactions? It is possible to have allergic reactions to most plants. If you’re quite sensitive to many plants and have allergic reactions to them, it’s a good idea to consult with your healthcare professional or allergist before using any new product coming from plants. It might be that you have to start out with a fraction of the suggested serving in order to see if you might react, but as always, please talk to your healthcare provider first. Can I take CBD with my prescription medication? Please consult with a healthcare professional familiar with CBD or your pharmacist regarding your current medications and CBD hemp oil. Many veterinarians are now recommending CBD for animals due to positive studies regarding animal health. Check with your own vet in regards to using any CBD product for your pet. What is the Hemp Farming Bill of 2018? Not to be confused with the 2014 Farm Bill, the Hemp Farming Bill of 2018 was introduced on the federal level by Senator Mitch McConnell in April and is being referred to as the Dream Bill by hemp advocates. The key reason for this is the bill will legalize hemp – not just stalk and seeds but ALL parts of the cannabis sativa L plant with a concentration of not more than 0.3% THC – on the federal level. The bill specifically de-schedules all derivatives, extracts, cannabinoids, and seeds of hemp as long as those portions remain below 0.3% THC, which will clear up the confusing grey area we currently navigating with respect to the DEA. Provisions from this bill have also been added to the 2018 Farm Bill, which passed in December 2018. Want to learn more? We've got some great websites for you. Are there terpenes added to your oil? Our Organic Ideal CBD does have some very beneficial terpene sources added to the formula: extracts of clove, hops and black pepper. These are found on the label in the ingredients list. Terpenes are aromatic plant compounds that can influence our bodies using the aromatic compounds. For example, the terpene called Linalol is what makes Lavender Oil have a relaxing effect on us. The terpenes added to our Organic CBD Oil formula include a very important terpene called Beta-caryophyllene which binds to CB2 receptors throughout the body. As with all Barlean’s products, we can ship directly to people throughout the US. We do have a small shipping fee for most direct orders. We don’t ship directly for international orders at this time. We take direct orders by phone through our customer service department. The number is 800-445-3529. Our customer service department is open between 8am – 5pm Monday – Friday. Sorry, we don’t do international shipments directly to consumers for any of our products at this time, but it is possible to purchase Barlean’s products at retail stores throughout the US. We do not sell our CBD hemp oils to any international retailers, but that may change. I need to report an issue, how do I do this? Please call our friendly customer service department at 800-445-3529 to resolve any issue. Barlean’s has an ongoing discount program called the Autism Hope Program. Under this program, we offer wholesale pricing to people who are either on the autism spectrum or have a family member on the spectrum. You can sign up for the program by calling our customer service department at 800-445-3529. At Barlean’s we’re on a mission to create prosperity for people around the world in a variety of meaningful ways. Which is why, since 2013, a significant portion of our corporate profits go straight to empowering children and families around the world to live healtheir, safer and happier lives. As a result, we have come to view our products in a new light. They have become more than nutritional supplements...they are now our primary vehicle for realizing our purpose of paving a Pathway to a Better Life for those most in need – both in our local area and throughout the world. I thought the 2014 Farm Bill (7606) already legalized CBD? The 2014 Farm Bill (Agricultural Act of 2014) defines hemp as distinct from marijuana and is often cited as evidence that CBD derived from industrial hemp is legal. In actuality, the Farm Bill made it legal to grow, cultivate and market hemp and hemp products as part of a state sanctioned industrial hemp research pilot program. I've seen the word "decarboxylated" on the label - what does this mean? Decarboxylation - or decarbing - is, through the application of heat, the chemical reaction in the fresh cannabis/hemp plant in which CBDA (raw, acidic cannabinoids) are converted into their more bioavailable form (CBD). Is your hemp oil Vegan/Vegetarian/Non-GMO/Solvent Free? Our Ideal CBD products in tincture form are Vegan/Vegetarian. The softgels are not. All products are Non-GMO and are currently under submission to be verified by the Non-GMO Project, however, one product is certified organic which also certifies that it is non-GMO. Organic Ideal CBD is solvent free. Extra Strength Ideal CBD and the softgels use a food grade, Kosher alcohol as a solvent in the extraction process. Ethanol/alcohol is the most historically used method for cannabis/hemp extracts. It is third-party lab tested and a clean extraction method that allows for optimal retention of terpenes and other sensitive compounds. Our products are extracted using two different methods: CO2 for our Organic Ideal CBD hemp oil and food grade, Kosher alcohol for our Extra Strength Ideal CBD hemp oil. While CO2 extraction retains fewer of the terpenes found in hemp, the cloves, hops and black pepper used in this product provide additional terpenes. Ethanol (alcohol) is the most historically used method for cannabis/hemp extracts. It is a clean extraction method that allows for optimal retention of terpenes and other sensitive compounds. Is it legal to ship across state lines? With the passing of the 2018 Farm Bill, the DEA no longer has claim to interfere with the interstate commerce of hemp products. Is CBD from the EU legal? In the European Union, it is legal to cultivate and supply cannabis plants for hemp fiber if they have levels of THC not exceeding 0.2%* (lower than our legal minimum of 0.3%). My friend said she felt nauseous after taking CBD. Is this normal? Nausea is not frequently reported after taking CBD. One possible cause could be the carrier oil used in the formula. If you're sensitive to oils, you may want to eat before taking it. We use MCT oil in our Extra Strength and hemp oil in our organic. Talk to your healthcare provider regarding any medical concerns. Check out the Ideal CBD Hemp Oil products we have available.